That's everything. What an amazing week. So, what's in your mailbox? 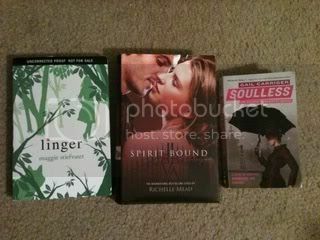 Soulless and Linger are on my list! Happy reading! Let me know what you think of Souless - that one intriques me also. Have you started Vamp Academy yet? 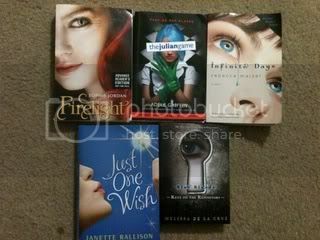 Glad to see Firelight there too - heard it's a really good book! Enjoy your books! Thanks, everyone. I just finished Firelight yesterday. It's freakin' amazing. You guys MUST check it out! Linger comes out so soon, you guys! I can't believe it! Great books this week. I cant wait for Linger.